All About Sports Cards: 2011 Topps Allen & Ginter Contains An Error... On The Box. 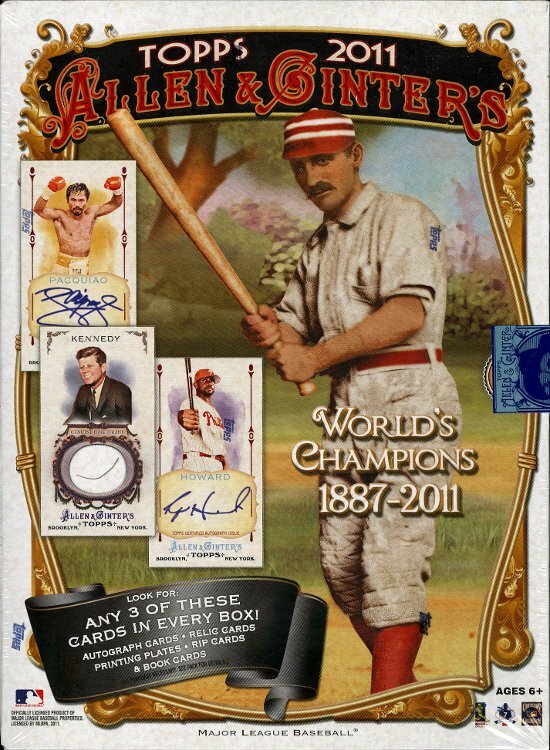 2011 Topps Allen & Ginter Contains An Error... On The Box. There has been speculation as to the rarity the Ryan Howard Auto Card found on boxes of 2011 Topps Allen & Ginter. They can't seemed to be found. There is a reason for that... they are not in the product. Topps has confirmed that "the Ryan Howard autographed card appearing on the 2011 Allen & Ginter box is not on the checklist nor in the product." May people were certain it was in the checklist, but here's a look at the checklist included in the box. No Ryan Howard. There was no further information as to why the card is on the box. The Nick Markakis and Brian Matusz autographs that were on the sell sheet checklist didn't make the final cut either. I can't believe there isn't a single Orioles auto for me to chase.